Inked is the first YA fiction novel I've read in a really long time. To be honest the book's cover is what reeled me in. The vibrant blue is hard to ignore. I'm glad I took the plunge because I thoroughly enjoyed the book. When I think of YA novels, I think of vampires, witches and other monsters. I'm SO glad that this novel has none of that, kind of. It's an original story filled with a ton of action and a touch of magic. It took a few tries to get start mostly because every time I turned on my Kindle the kids decided that's when they were going to wake up. Last night I read it from start to finish in just 3 hours with only a couple interruptions here and there. In a fictional world ruled by the Citadel, it is made mandatory that all inhabitants of the realm be inked when they come of age. The inking identifies each citizen's destiny by marking them with symbols associated with their intended occupation. The story begins with Caenum, three days away from his inking, who is gathering his belongings as he prepares to runaway. Caenum believes people should get to choose their destiny and not have to follow what the ink tells him. His plans to run away are postponed when he's startled by Dreya, his childhood friend and love interest. Soon after Caenum's runaway plans are foiled, he encounters Kenzi, who they discover is a Conduit. A person with magical powers. Caenum's grandmother fears what will happen to Kenzi and volunteers to take him to the Sanctuary. Caenum cannot let this happen and takes his grandmother's place. The story then follows Kenzi and Caenum on their journey where they encounter the Unprinted, citizens who have refused to be inked, and other unexpected characters. This is a great book that can be a standalone novel. However, I do hope that the author, Eric Smith, decides to continue the story. Inked is a 5 out of 5 in my mind. I'd recommend this book to anyone that's looking for a quick and intriguing read or to YA fiction readers who are looking for a fresh and unique story with characters they can easily relate to. The book is available in digital format on Amazon.ca. Has anyone else read it? What did you think? Leave a comment below & let's talk it out. 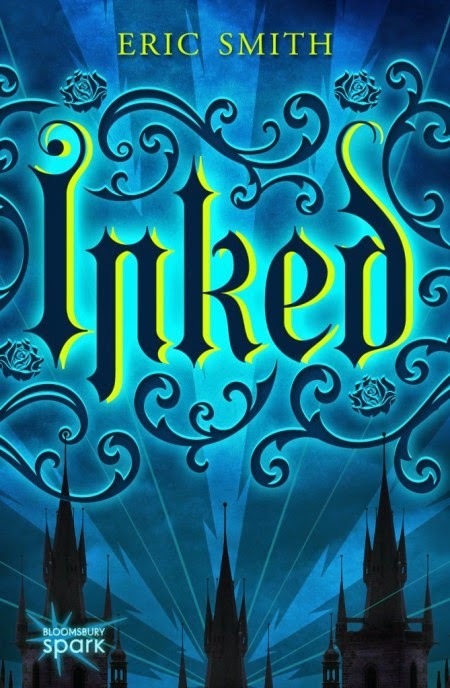 I received a complimentary copy of Inked from NetGalley in exchange for my honest review.